Home » Ask The Reader: Should You Finance An Engagement Ring? I consider myself to be very traditional, and think that you should save up you salary and wait to buy an engagement ring until you can afford it. In fact, I think your bride-to-be should value that more than going into debt for an engagement ring. I think a marriage should start on a solid financial footing as much as anything else, and I don't think going into debt for a ring is worth it. However, there must be a demand for it since it was advertised on television! So, I wanted to reach out to reader and see what there thoughts were on financing an engagement ring? Yes? No? Maybe? Do You Even Still Need To Buy An Engagement Ring? Before we start the bashing of financing an engagement ring, there has to be some "pros" right? It's clear if you scroll through the comments that most readers don't think you should finance an engagement ring. But there are some people that think it's okay. For example, one of the strongest arguments for financing a ring is simple: If you can get a 0% for 12 months deal, why not take it and then pay it off over the 12 months - it's effectively free money. And that's totally valid. You're not going to find a 0% APR offer many places (especially when you're looking at the best personal loans). Taking advantage of a great financing offer can actually help you because you get all that extra time to save and/or invest. If you can get 12 months at 0% APR, the value of not having to pay could be a significant amount of interest. For example, if you check out the best rates on our high yield savings account table - you can currently earn about 2.25% on a savings account. If you were going to spend $5,000 on an engagement ring, you could instead save that money and earn $113.67 in interest over the course of that year. Then, you simply pay off the loan for the ring. That's a great deal, right? In the first bucket, you and your soon-to-be wife should be on the same page when it comes to money. And hopefully that is a positive page when it comes to money. If you can't afford to pay cash for an engagement ring, you likely shouldn't do it. If your partner loves you, you don't need to go out and spend a fortune. Getting married isn't about the ring, it's about spending your lives together. In the second bucket, you shouldn't be going into debt ever (but definitely not to start a marriage). In fact, many people are working themselves out of debt to begin with, so you shouldn't be adding more to buy a silly ring. That's such a great thought - if you can't afford the ring, can you really afford a wife and kids? Especially the kids part - because kids are expensive. I think most readers agree that financing an engagement ring is a big no-no. The old rule about an engagement ring is that the husband should save 2 months salary and use that to buy a ring. But, do you even need to buy an engagement ring still? And if you feel that you do, do you really need to go "all out" with two months salary? Millennials are changing the game when it comes to buying things - including engagement rings. Most millennials really don't have a big value on things, and view an engagement ring as a waste of money. That's not to say that they don't want a ring, but many are opting for alternatives to a ring or a cheap ring. A story recently stood out from Stefanie O'Connell, where she returned her engagement ring. She and her soon-to-be husband put a higher value on other things, versus having a fancy ring. But don't think you have to go ring-less. Most people would be happy with a simple band that you can get for $200 or less. You can buy an inexpensive wedding band at places like Costco, and still have a ring but be frugal while doing it. The fact is, most people aren't financing an engagement ring as a 0% APR hack. Most people are financing an engagement ring because they can't afford the ring they "really think their spouse wants." If you really want to get a ring, keep it simple. You can always upgrade the ring later if you really do place a higher value on it than you initially thought. It could make a great anniversary present. 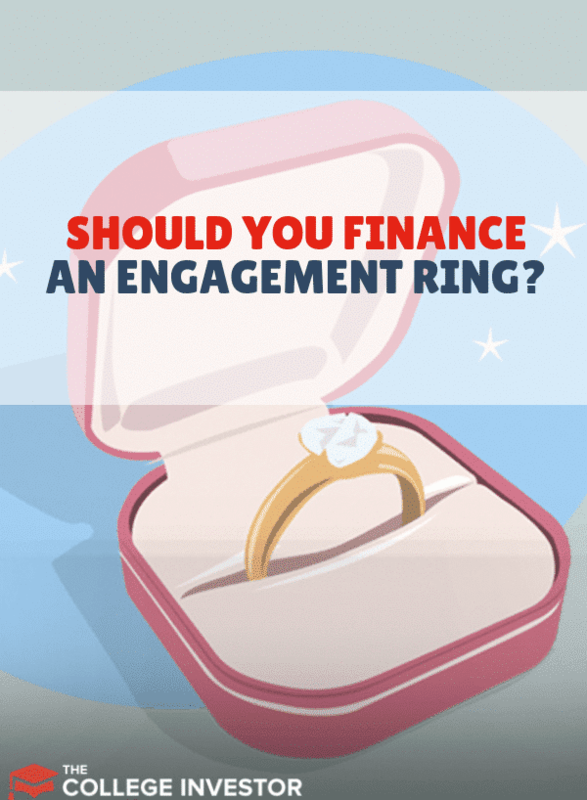 But the bottom line is you likely shouldn't finance an engagement ring. I just can’t think of any good reason “why” you should do that. If you only can get your fiancee to say “yes” when you go for the engagement ring that needs financing… and you fall for that… good luck; you deserve each other. I bought my fiancee’s ring without going into debt. I started saving in college….for her. I didn’t even know her then! I just knew I wanted to get married and knew one day the Lord would bring me my wife…and I wanted to have the money. I think it’s ridiculous to go into debt for a ring. I even went back and forth to major jewelers and brought them down. I finally settled on a private jeweler and got it for half the price I would have at a major store. I think it’s silly when people tell you you have to spend the amount of your salary for a month (or is it two?). That information probably comes from jewelers! I didn’t go cheap for my bride to be, but I went smart. She would have killed me had I gone into debt for her. Seriously, what ever happened to saving for two months (whether or not it came from the jewelers)? I would much rather have a ring that a guy saved for than something he had to finance. When I got married, my engagement ring only cost $200. And probably my only regret about being divorced is that I can’t wear it anymore. I loved that ring! I didn’t need something that cost thousands of dollars, and I’ll still feel that way if I ever get remarried someday. Agreed, I didn’t give my wife a borrowed ring. It was a hard earned ring with my first job. I totally agree! I feel like an engagement ring is a token of your love and if your paying on it and (eeek) going into debt it’s not the right way to go. Men, work your little booties off and if she’s worth it, buy her the ring. If that is the only way possible because of a current financial situation then it is understandable. However I don’t think you should finance an engagement ring. If you finance the ring, it is likely you will be paying for it after you get married, which means now you are both paying for something that was supposed to be coming from you alone. I don’t think you should let it be “the only way possible”. Save some money, then get the ring! It is definitely a bad idea to finance an engagement ring with debt. Just imagine if the engagement broke up and you couldn’t get the ring back. You would be stuck holding the bag for that money. You also need to make sure that it is ensured properly with floater insurance. I don’t think it’s ok to go into debt for anything that isn’t life-threatening, and an engagement ring sure isn’t that. Plus, I think it just starts things off on the wrong foot. My husband told me (later) that if I had asked for a big, fat, ring, that would have been a dealbreaker for him. One of the ways he knew we were right for each other is I only wanted a simple ring, and that I was more focused on a marriage, than a wedding. You answered the question. I think you need to go with your heart as your answer is in your blog. go with the truth or your truth and you can’t go wrong. The first gift should not be financed. A ring is first gift for your wife. Later on I don’t think any girl would mind receiving other jewellery on loan. I can see all your comments. I agree, starting out a marriage with as little debt as possible is the way to go. And lets face it, if you can’t save up enough money to buy a ring, can you really afford a wife (and eventually kids)? 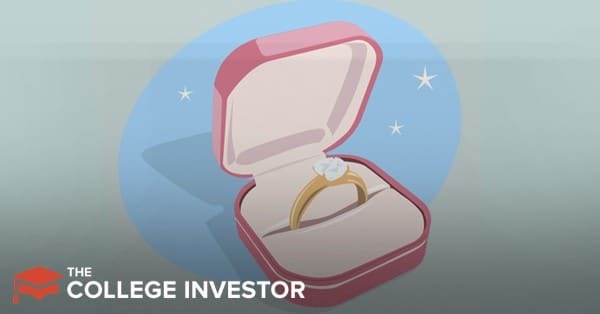 i dont think AT ALL that u should go into debt for engagement ring or the wedding , you want a good start for your mariage and i dont think going into debt is going to give u that ! I agree you should definitely wait till you can pay for it. 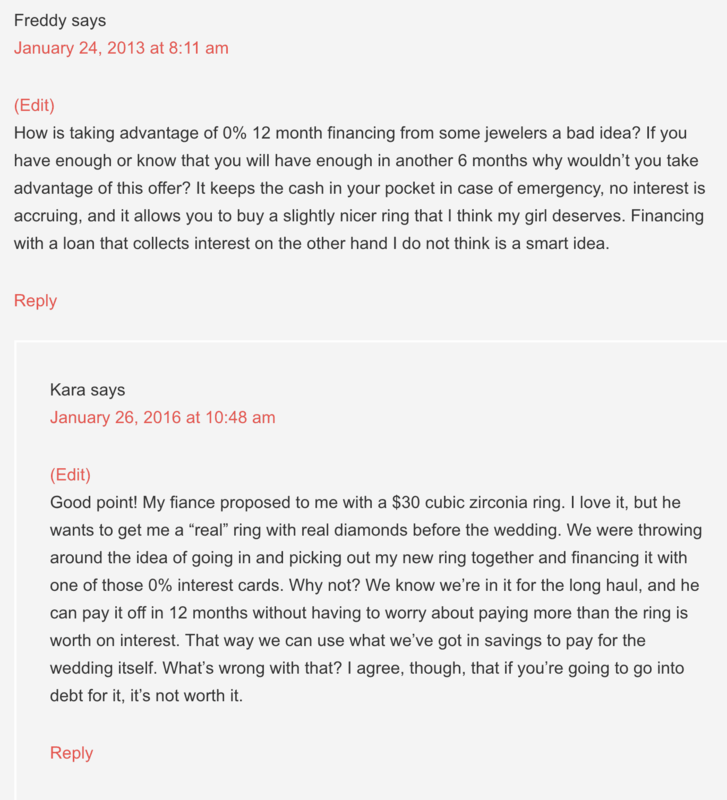 You should never finance any ring… there is no need. Many people think you have to have everything at once and you don’t. You can start off with a smaller stone and always have a larger one put in if thats what you want, and it makes for a nice 10 or 20 year anniversary gift. I know many people who have went with the larger stone at a later date when finances are better. How is taking advantage of 0% 12 month financing from some jewelers a bad idea? If you have enough or know that you will have enough in another 6 months why wouldn’t you take advantage of this offer? It keeps the cash in your pocket in case of emergency, no interest is accruing, and it allows you to buy a slightly nicer ring that I think my girl deserves. Financing with a loan that collects interest on the other hand I do not think is a smart idea. Good point! My fiance proposed to me with a $30 cubic zirconia ring. I love it, but he wants to get me a “real” ring with real diamonds before the wedding. We were throwing around the idea of going in and picking out my new ring together and financing it with one of those 0% interest cards. Why not? We know we’re in it for the long haul, and he can pay it off in 12 months without having to worry about paying more than the ring is worth on interest. That way we can use what we’ve got in savings to pay for the wedding itself. What’s wrong with that? I agree, though, that if you’re going to go into debt for it, it’s not worth it.